Last updated October 21, 2018. 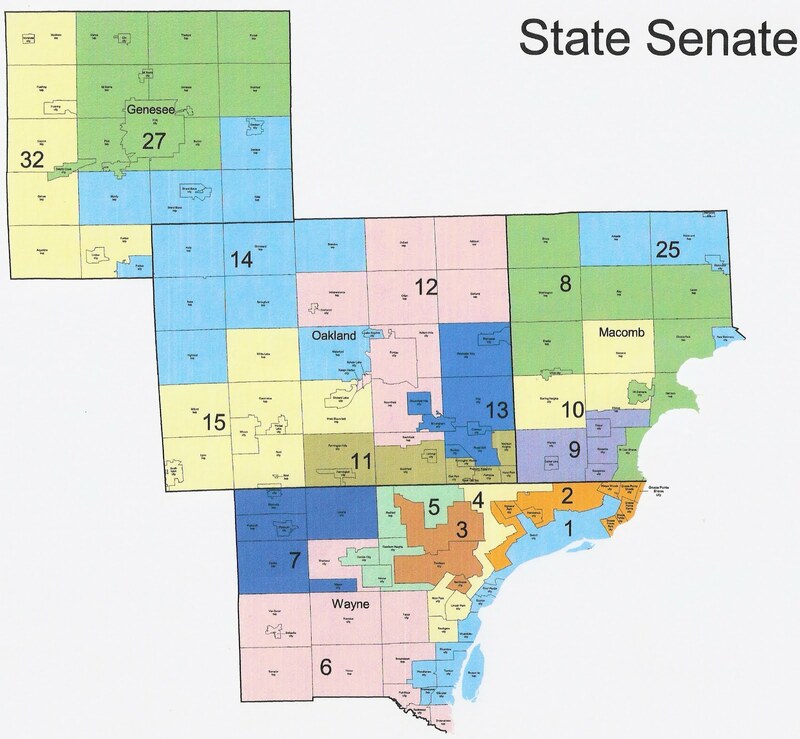 All 38 seats in the Michigan Senate are up for election in 2014. Republicans currently have a 27-11 supermajority, and have controlled the senate since 1983. Republican control of the state senate has prevented democrats from complete control of Michigan's government in some years, and stopped a lot of bad things from being passed. Fortunately for Republicans, the Michigan state senate is up only in midterms, which usually favor Republicans much more than presidential years. Republicans had a good year in 2014, picking up one state senate seat, following four pickups in 2010. The 2010 redistricting produced a map that was moderately pro-Republican, while complying with all relevant laws. There are 26 open seats due to term-limits, 7 D and 19 R. All current state senators are former state representatives except three (Colbeck, Conyers, Hertel). Next year, three Detroit-based districts will have senators with no house experience. For the past few years, the state senate has been more moderate than the state house. This cycle, several ideologically split Republican primaries resulted in a state senate that will be slightly more conservative than before. I have included election data for the 2014 state senate election, and McCain (2008), Romney (2012), and Trump (2016) results in each district. More data is available from Republican Michigander and RRH Elections. The McCain numbers look terrible for Republicans because he collapsed after publicly pulling out of Michigan. 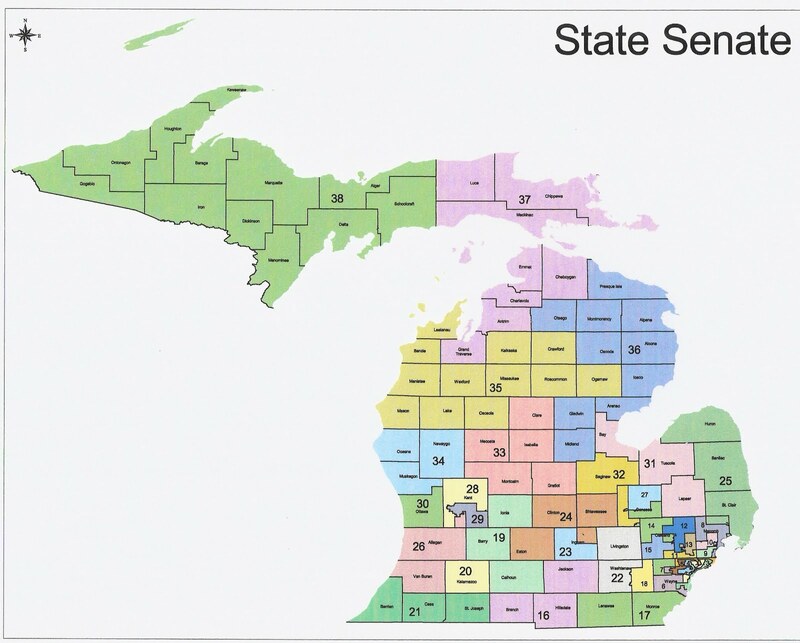 The largest McCain percentage in any Michigan state senate district won by a democrat in the past twelve years is 46.2% in (old) district 31. Here is a breakdown of the individual races. State reps years in office are listed after their names, with P meaning present. This is one of five black-majority districts based in Detroit. Young, who lost badly in his bid for Detroit Mayor, is now running for Congress. State rep Stephanie Chang (14-P) easily defeated Bettie Cook Scott (06-10, 16-18) and Alberta Tinsley-Talabi (10-16), along with along with James Cole, Nicholas Rivera, and Stephanie Roehm. Chang is a progressive favorite who was insulted for racial reasons by Scott. Pauline Monte is the R candidate. This is one of five black-majority districts based in Detroit. Johnson pled guilty to theft (hiring a fake employee to pay a debt). There will be a special election at the same time as the general election. Incredibly, eleven Ds ran. Adam Hollier, Johnson's former chief of staff, won the primary thanks to many endorsements, including that of Mayor Duggan. In second was Hamtramck city commissioner Abraham Aiyash. Third was eight-time felon and disgraced former rep Brian Banks (12-17), who resigned in a plea bargain. Also running were former rep George Cushingberry Jr. (74-82, 04-10), who lost his seat on the Detroit city council due to scandal, former rep John Olumba (10-14), who became an independent in 2013, and former state rep Lamar Lemmons (99-06). Also-rans include Tommy Campbell, Lawrence Gannon, Anam Miah, William Phillips, and Regina Williams. Lisa Papas beat John Hauler for the R nomination. This is one of five black-majority districts based in Detroit. Detroit State rep Sylvia Santana (16-P) won a close race over former R state rep (98-04) and D county commissioner (04-P) Gary Woronchak of Dearborn, with Anita Bella and Terry Burrell far behind. The R candidate is Kathy Stecker. This is one of five black-majority districts based in Detroit. Virgil Smith resigned after pleading guilty to shooting at his ex-wife. The 2016 special election was won by Ian Conyers, defeating State rep Fred Durhal (14-P). Conyers, the great-nephew of Congressman John Conyers, lost a race for Congress this year. Marshall Bullock, who had the backing of Mayor Duggan, defeated Durhal and Carron Pinkins. The R candidate is Angela Savino. This is one of five black-majority districts based in Detroit. Knezek, who is white, won a split primary with 29% in 2014. He was shockingly upset by Betty Alexander, a black woman who raised no money. The upset was masterminded by her relative, former rep Lamar Lemmons III. The R candidate is DeShawn Wilkins. Liberal rep Erika Geiss (14-P) beat moderate state rep Robert Kosowski (12-18) for the D nomination. The R candidate is Brenda Jones. State rep Laura Cox (14-P), who represented more than half of the district on the Wayne County commission, is the R candidate. Dayna Polehanki beat Ghulham Qadir, who raised significant out of state money, and was credibly accused of spousal abuse, for the D nomination. Cox is a strong candidate, but Ds had high primary turnout here. R state rep Peter Lucido (14-P) defeated former rep Ken Goike (10-16), who represented only 5% of the district. Ds nominated Paul Francis over Patrick Biange and Raymond Filipek. D state rep (96-02) and Warren city clerk Paul Wojno beat Kristina Lodovisi. Rs nominated Jeff Bonnell over Fred Kuplicki. Republicans suffered a significant recruitment failure here. The R candidate is Doctor Michael Macdonald, who beat former state house candidate Michael Shallal and gadfly Joseph Bogdan. D state rep Henry Yanez (12-18) is a strong candidate who has held a swingy district. Primary turnout was decent for the GOP. D State rep Jeremy Moss (14-P) of Southfield easily beat Crystal Bailey, Vanessa Moss, and James Turner. The R candidate is Boris Tuman. Moderate state rep Michael McCready (12-18) beat conservative state rep Jim Tedder (14-P) by only 1%, with Vernon Molnar and Terry Whitney acting as spoilers. The D candidate is Rosemary Bayer. Low turnout in Pontiac usually hurts Ds in midterms in this district, but primary turnout was high this time. Knollenberg won a very close primary in 2014. The D candidate is businesswoman Mallory McMorrow. There was high D turnout in the primary here. Surprisingly, Secretary of State (10-18) Ruth Johnson, who once represented this area as a state rep (98-04), is seeking to move down to the state senate. She easily beat Katherine Houston in the R primary. Renee Watson won the D nomination over Cris Rariden and Jason Waisanen. Kowall beat Tea Party leader Matt Maddock only 50-43 in the 2014 primary. Conservative state rep Jim Runestad (14-P) won the nomination over Mike Saari, and Maddock won the nomination for Runestad's house seat. The D candidate is Julia Pulver. Shirkey, who led the fights for both Right to Work and Medicaid expansion, is the presumptive favorite to be the next senate majority leader. He beat conservative Matt Dame, who had the support of previous incumbent Bruce Caswell. The D candidate is Val Toops. Rs have held this competitive district for at least the last five elections. Zorn defeated rep Doug Spade (98-04) in 2014. The D candidate is state rep Bill Lavoy (12-16), who lost his 2016 reelection by 8%. Ann Arbor loves electing left-wing feminist state senators, including Warren, Liz Brater, Alma Wheeler Smith, and Lana Pollack. D state rep Jeff Irwin (10-16) narrowly beat Washtenaw County Commissioner Michelle Deatrick, businesswoman Anuja Rajendra, and Matthew Miller. The R candidate is Martin Church. Calhoun County state rep John Bizon (14-P) beat moderate R state rep Mike Callton (10-16) of Barry County in an expensive primary. The D candidate is Jason Noble. Kalamazoo County is a battleground, with Ds usually winning the top of the ticket, and Republicans doing better at the bottom. In 2014, O'Brien (10-14) defeated D state rep Sean McCann (10-14) by just 61 votes, with Libertarian former R state rep Lorence Wenke (04-10) taking 9%. McCann and Wenke are running again, setting up a three-way rematch of 2014. O'Brien is a strong campaigner who is now an incumbent, but there was heavy D turnout in the primary. Conservative state rep Kim LaSata (16-P) beat moderate state rep Dave Pagel (12-18) for the R nomination. The D candidate is Ian Haight. R state rep Lana Theis (14-P) easily beat Joseph Marinaro. The D candidate is Adam Dreher. Hertel, then Ingham Register of Deeds, won this seat in 2014. Andrea Pollock beat Nancy Denny for the R nomination. Conservative state rep Tom Barrett (14-P) easily defeated moderate state rep Brett Roberts (14-P), who represents only 7% of the district. D Public affairs specialist/lobbyist Kelly Rossman-McKinney is running, and has raised a lot from her Lansing contacts. House majority leader Dan Lauwers (12-18) is the R candidate. Debbie Bourgois is the D candidate. State rep (10-16) and lottery commissioner Aric Nesbitt beat conservative former state rep (08-14) and Allegan County Clerk Bob Genetski, with dentist Don Wickstra in third. D Garnet Lewis, who lost the primary for the 32nd district in Saginaw in 2014, is the D candidate. Ananich, who won a special election in 2013, is now the D state senate minority leader. The R candidate is Donna Kekesis. MacGregor, who was elected in 2014, holds one of the safest R districts in Michigan. Craig Beach beat Gidget Groendyk and Ryan Jeanette for the D nomination. This district has been trending away from Rs at the top of the ticket, but has more R strength downballot. Moderate R state rep Chris Afendoulis (14-P) easily beat Daniel Oesch. State rep Winnie Brinks (12-18) is the D candidate. Turnout favored dems in the primary. Ottawa County is usually the most Republican in Michigan. State rep Roger Victory (12-18) defeated reps Daniella Garcia (14-P) and Joe Haveman (08-14) and conservative activist Rett DeBoer. Garcia and Haveman represented the same district and split the vote there. The D candidate is Jeanette Schipper. This district has alternated between parties every 8-10 years since the 1980s. Mike Green narrowly won the 2014 primary 50-46 over state rep. Kevin Daley (08-14) of Lapeer County. Daley beat conservative state rep Gary Glenn (14-P), who recently moved to Bay County and had Green's support. D Bay County Clerk Cynthia Luczak, who is pro-life, beat school counselor Bill Jordan, Joni Batterbee and Chuck Stadler. 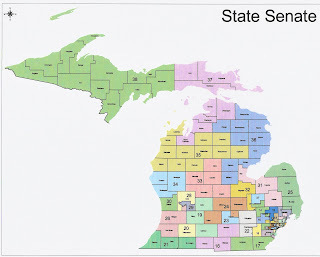 Incredibly, despite D dominance of Saginaw County, Rs have won this district for the last seven elections. D state rep Phil Phelps (13-18) of Flushing beat veteran Henry Gaudreau, despite representing only 3% of the senate district. R state rep Rick Outman (10-16) easily beat former state house candidate Greg Alexander. Mark Bignell beat John Hoppough for the D nomination. R state rep Jon Bumstead (10-16) of Newaygo, an early endorser of Trump, beat self-funding state rep. Holly Hughes (10-12, 14-18) of Muskegon County. Activist Poppy Sias-Hernandez upset state rep Collene Lamonte (12-14), who defeated Hughes in 2012 and lost a rematch in 2014, for the D nomination. Rep Curt VanderWall (16-P) beat conservative state rep Ray Franz (10-16), rep Bruce Rendon (10-16), and Cary Urka for the R nomination. The D candidate is Mike Taillard. This district was competitive in 2002, but has moved right since then. Stamas is in line to be the next appropriations committee chairman. The D candidate is Joe Weir. Schmidt won a bitter primary in 2014. He beat conservative teacher Jim Gurr this time. The D candidate is Jim Page. This district was held for Ds for decades until Casperson won it in 2010. R state rep Ed McBroom (10-16) of Dickinson County beat moderate Mike Carey in the R primary. Moderate D state rep Scott Dianda (12-18) from western UP is a strong candidate.